AURCET 2018 Final Selection list Results announced, List of Certificates for Admission Counselling, Web options, Seat allotment dates: PhD, M Phil Entrance Test Results, AURCET 2018 Web options Excercising dates, AURCET Seat allotment dates, AURCET Certificates verification: The Andhra University on Monday announced AURCET-2017 results and posted them in www.audoa.in. The entrance tests were conducted among 51 subjects for admission into Ph D (Full-Time/ Part-Time)/M Phil. (Full-Time/Part-Time) programmes. A total number of 11,153 candidates had applied for AURCET and only 8,117 candidates appeared for the written examination. 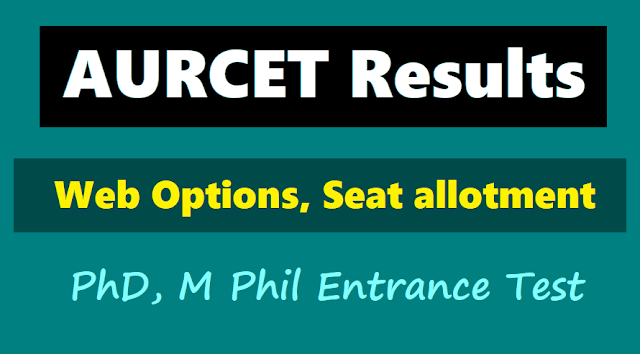 AURCET Final Selection List Results - Provisional allotment list of candidates for admission into Ph.D. (Full-Time/Part-time) / M.Phil. (Full-Time / Part-Time) subject to fulfillment of eligibility criteria & submission of necessary original certificates. Schedule for Admission Counselling into M.Phil./Ph.D. Full-Time / Part-Time Programmes in Science / Arts / Engineering / Pharmacy / Law courses. AURCET 2017 Ph.D. (Full-Time/Part-time) / M.Phil. (Full-Time / Part-Time) Admission Intimation Memo download from Website. Visakhapatnam on the scheduled date. 1. Hall Ticket of AURCET-2017. 2. Provisional / Original Certificate and marks statements of qualifying examination. Candidates are expected to submit the consolidated statement of marks. 3. Proof of local candidates status (Study Certificates of last 7 years ending with the qualifying degree in case of regular study or Residence Certificate (10 years) in case of distance mode of education / private study). 4. Integrated Community Certificate issued by the competent authority in case of SC/ST/BC candidates. 5. Transfer certificate from the institution where last studied (To be submitted). 6. All service certificates with present service and No objection certificate from the present employer in case of admission into Part-Time Research programme. (Present Service Certificate & No Objection Certificate are to be submitted). 7. Equivalence Certificate if necessary to satisfy the eligibility criteria. 8. Migration certificate in case of candidates from other Universities. All candidates have to pay Rs.500/- as Library fee and all the candidates except those having M.Phil./M.Tech./M.Pharm / L.L.M degrees have to pay Rs.2,000/- as examination Fee. AU Director of Admissions K Rajendra Prasad said that 5,035 candidates from 51 subjects were called out for oral examination. AU officials said that the certificate verification process was done, and scratch cards have been issued to candidates to exercise web options. The exercising of web options will be available from March 5 to 9 and the allotment of seats will be done by March 19. The scholars should submit their original certificates and fee payment according to the schedule posted in the website from March 26 to April 2. Provisional allotment list of candidates for admission into Ph.D. (Full-Time/Part-time) / M.Phil. (Full-Time / Part-Time) subject to fulfillment of eligibility criteria & submission of necessary original certificates. Schedule for Admission Counselling into M.Phil./Ph.D. Full-Time / Part-Time Programmes in Science / Arts / Engineering / Pharmacy / Law courses. AURCET 2017 Ph.D. (Full-Time/Part-time) / M.Phil. (Full-Time / Part-Time) Admission Intimation Memo download from Website.